(Photo: REUTERS / Mohamed Azakir)Lebanese Army soldiers patrol with their weapons after clashes in south Beirut March 23, 2014. One person was killed and 10 people were wounded in clashes in south Beirut on Sunday between supporters of Syrian President Bashar al-Assad and rival fighters, security sources said. BEIRUT (Reuters) - An influential Lebanese militant leader and cleric called for Sunni Muslims to defect from the army, in a 20-minute tirade posted on YouTube likely to intensify sectarian tensions between Sunnis and Shi'ites in Lebanon. Ahmad al-Assir, rumoured to have been killed fighting in neighbouring Syria, has been in hiding since June when the army and Shi'ite militants stormed his base in Sidon, the worst violence there since Lebanon's own 1975-90 civil war. Assir's order is unlikely to result in a mass exodus of Sunni soldiers in the religiously mixed army but the video, uploaded on Sunday evening, will stir up religious division and violence that have grown since the start of Syria's conflict. It was not clear when or where the footage was filmed but Assir mentioned last week's blockade of the border town of Arsal, indicating it was new. Mixing classical Arabic with Lebanese dialect, Assir called Christian army commander General Jean Kahwaji a "criminal". He asked Lebanese Sunnis in the army, including administrative and relief workers, if they wanted to continue being "partners to the killers and criminals when they commit aggression against our people and brothers in all places". Relatively unknown two years ago, Assir's speeches against powerful Shi'ite Hezbollah leader Sayyed Hassan Nasrallah and protests against Syrian President Bashar al-Assad have won him the allegiance of many Lebanese Sunnis, especially hardliners. In June, Assir's men killed 18 soldiers in a two-day gun battle in a wealthy neighbourhood of Sidon. Assir fled after his men suffered heavy losses and called the event a "massacre" in Sunday's speech. 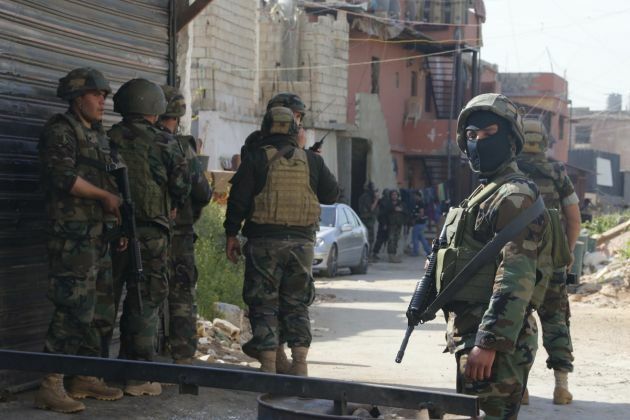 Lebanese media suggested he had moved to Syria - where mostly Sunni Muslims are fighting against Assad, a member of the Shi'ite Alawite sect - and rumours spread that he been killed when the Syrian army took the border town of Yabroud this month. With memories of their own civil war still vivid, leaders of Lebanon's sectarian-based political factions have until now tried to minimise points of friction to avoid upsetting the careful balance that has kept the peace since 1990. Assir said Lebanon is "completely dominated by the Iranian project", referring to Shi'ite Iran's support for Hezbollah, which hardline Sunnis say works hand in hand with the army.